Figure 1. 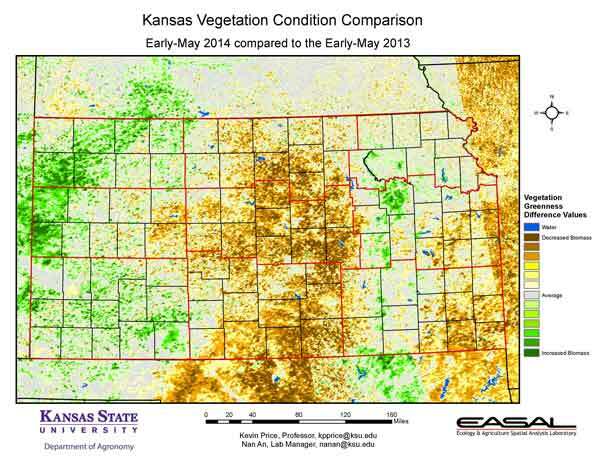 The Vegetation Condition Report for Kansas for April 29 – May 12 from K-State’s Ecology and Agriculture Spatial Analysis Laboratory shows that vegetative activity continues to expand northward in the eastern third of the state. In the western areas, biomass production is very limited. Extreme temperatures – both heat and freeze – coupled with drought have stressed vegetation. Figure 2. 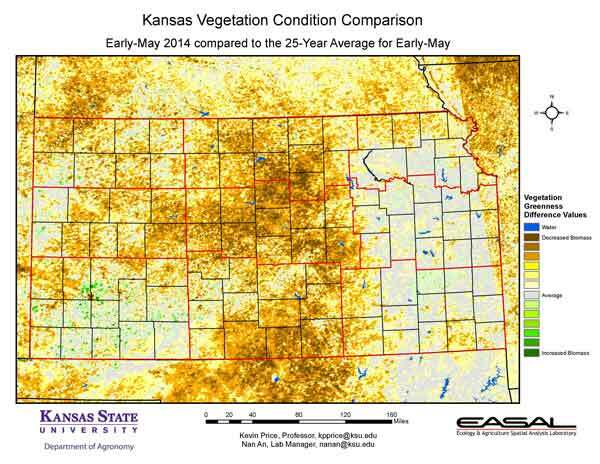 Compared to the previous year at this time for Kansas, the current Vegetation Condition Report for April 29 – May 12 from K-State’s Ecology and Agriculture Spatial Analysis Laboratory shows that parts of northwest and west central Kansas have higher NDVI values. This is due mainly to the extremely poor conditions that dominated the region last year rather than high productivity this year. Figure 3. 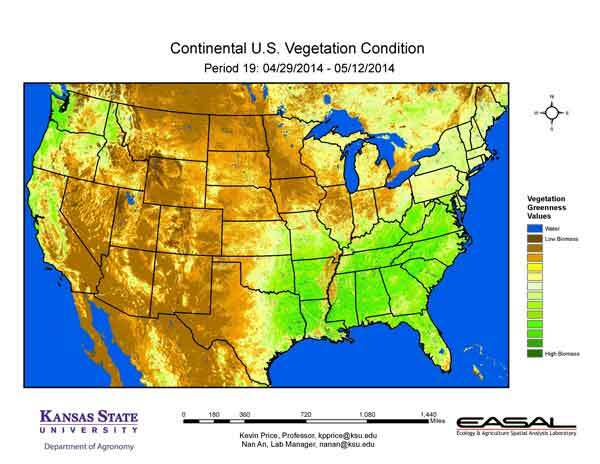 Compared to the 25-year average at this time for Kansas, this year’s Vegetation Condition Report for April 29 – May 12 from K-State’s Ecology and Agriculture Spatial Analysis Laboratory shows much-below-average photosynthetic activity in the central third of the state. Cold temperatures and dry conditions have stressed vegetation. This stress is also beginning to develop in southeast Kansas, while parts of southwest Kansas are benefitting from the early season irrigation during this two-week composite period. Figure 4. 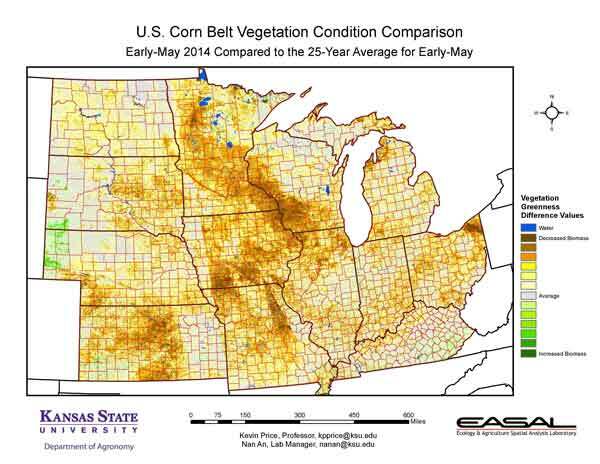 The Vegetation Condition Report for the Corn Belt for April 29 – May 12 from K-State’s Ecology and Agriculture Spatial Analysis Laboratory shows that very low biomass productivity continues in the northern portions of the region. There are still reports of 4-inch soil temperatures below freezing in parts of North Dakota and Minnesota. Figure 5. 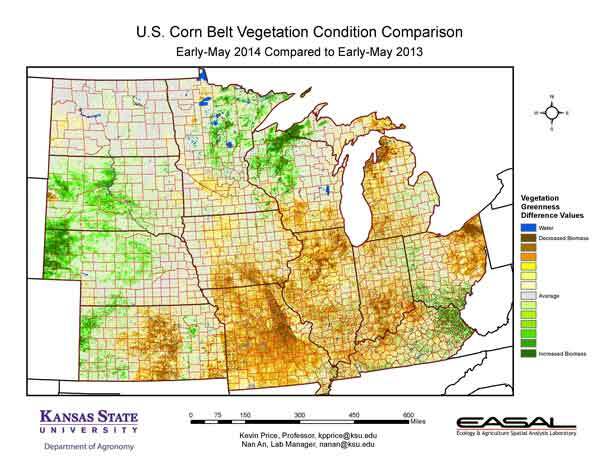 The comparison to last year in the Corn Belt for the period April 29 – May 12 from K-State’s Ecology and Agriculture Spatial Analysis Laboratory shows lower biomass production is centered in Missouri and Illinois. Delayed planting and continued cool weather have reduced vegetative activity. 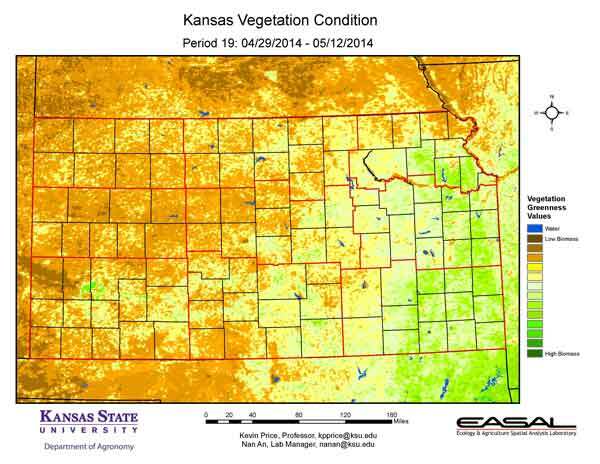 In central Kansas, the combination of drought and late freeze (Apr 15th) have reduced photosynthetic activity. Figure 6. 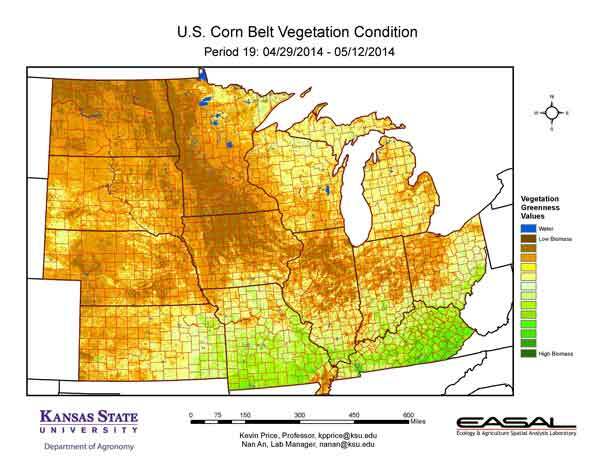 Compared to the 25-year average at this time for the Corn Belt, this year’s Vegetation Condition Report for April 29 – May 12 from K-State’s Ecology and Agriculture Spatial Analysis Laboratory shows that below-average biomass production is concentrated in the center of the region. In the eastern part of this area, the main culprits are delayed planting, cool temperatures, and cool soils. In Kansas, the main culprit is drought and the severe winter, coupled with freezing temperatures on April 15th. Figure 7. 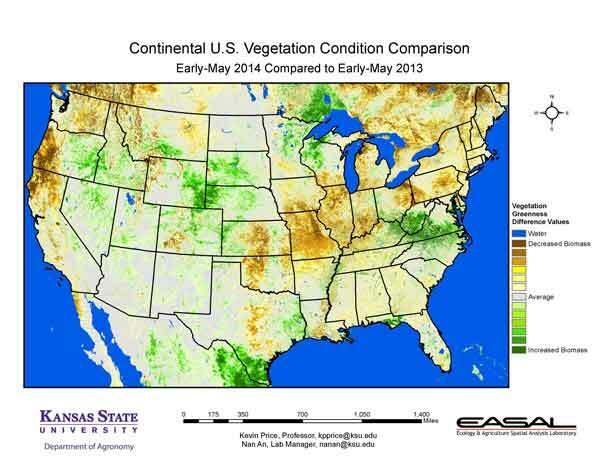 The Vegetation Condition Report for the U.S. for April 29 – May 12 from K-State’s Ecology and Agriculture Spatial Analysis Laboratory shows that increased vegetative activity continues to spread northward along the Atlantic Seaboard, and also remains a feature in the Pacific Northwest. Figure 8. 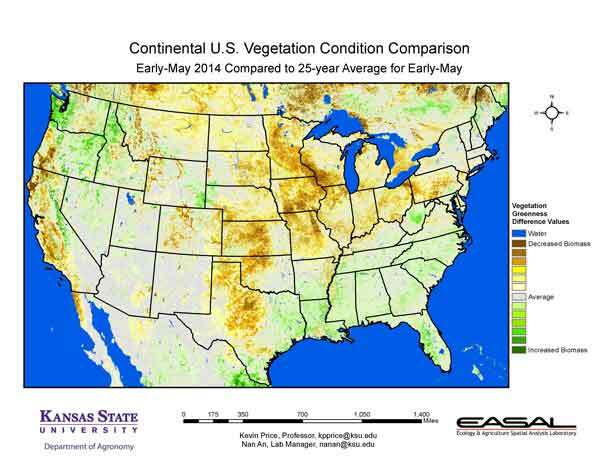 The U.S. comparison to last year at this time for the period April 29 – May 12 from K-State’s Ecology and Agriculture Spatial Analysis Laboratory shows that parts of Virginia and West Virginia have higher levels of biomass production, as do parts of eastern Wyoming and the Nebraska Panhandle. Favorable moisture and temperatures in these areas have increased photosynthetic activity. In contrast, much the central U.S. has lower biomass production. From Missouri eastward the major factor is persistent cold temperatures. From central Kansas through central Texas, drought is the major culprit. Figure 9. The U.S. comparison to the 25-year average for the period April 29 – May 12 from K-State’s Ecology and Agriculture Spatial Analysis Laboratory shows that below-average biomass production is concentrated in the central parts of the U.S. and along the West Coast from Oregon through southern California. East of Missouri, the cool, wet spring has delayed development. To the west, worsening drought conditions are taking a toll on the vegetation in the Central/Southern Plains and along the Pacific Coast.